If you travel to or from the Fish River Canyon, you simply have to stop at the Canyon Roadhouse. This is one of those places that you will treasure in your memory bank and will want to tell other people about. Being literally in the middle of nowhere, Canyon Roadhouse is an oasis to travellers. 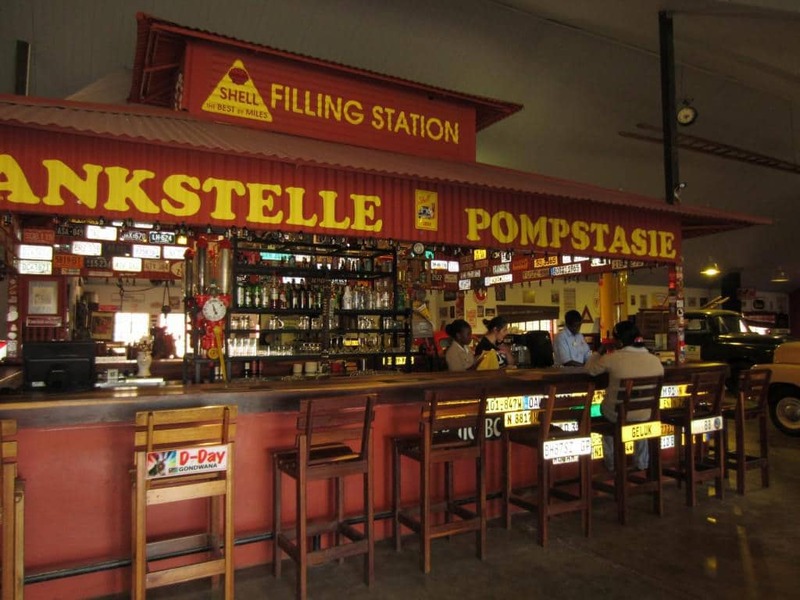 Apart from offering excellent guest house accommodation, they also have camping facilities and a fuel stop. But that isn’t what makes the Roadhouse so special. The bar, a-la-carte restaurant and curio shop is fitted into a big shed which is decorated with all kinds of antique automobiles. 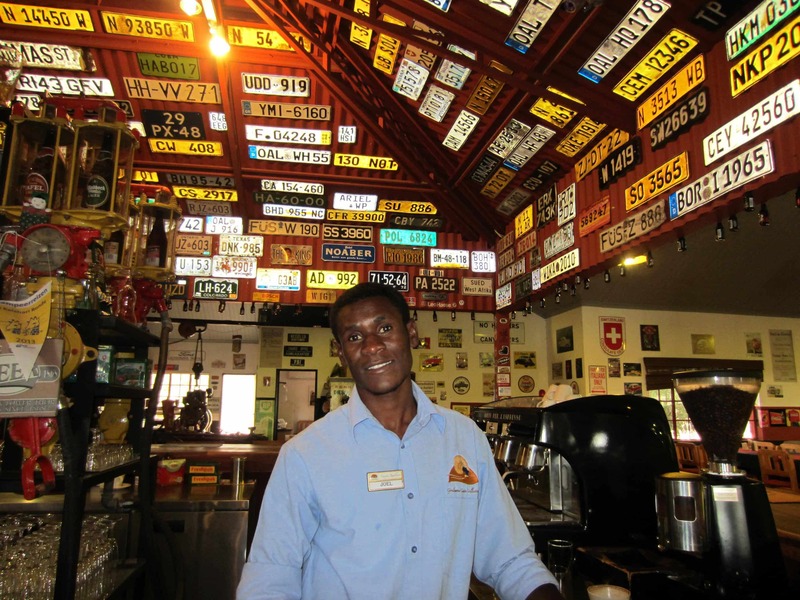 The welcoming bar displays car number plates from all over the world. The automobile theme is carried through to the yard where antique cars and trucks are selectively scattered all over the garden. The tables of the restaurant are scattered between old cars. 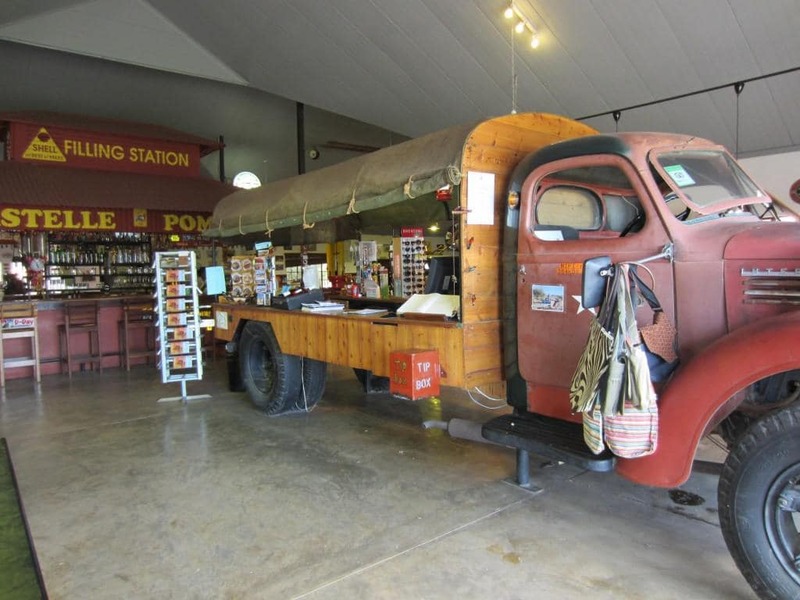 An old truck is the display area of the Curio Shop. Fill up your own tank at the bar. Joel, the friendly bar man, with number plates from all over the world behind him. 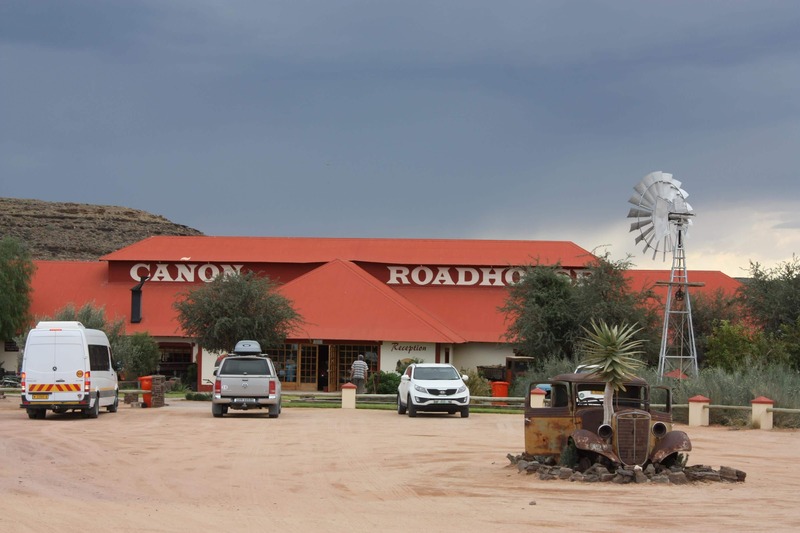 Canyon Roadhouse has become a popular stop en-route to or from the Fish River Canyon because of the old worldly ambiance. Even if you are not a huge fan of antique cars, it is simply impossible not to indulge in the joyous spirit of the beautifully renovated vehicles from yesteryear. A beautiful old Mercedes truck. Apparently the idea of having an antique automobile theme was sparked by a rusted old car in the yard of the original farm. 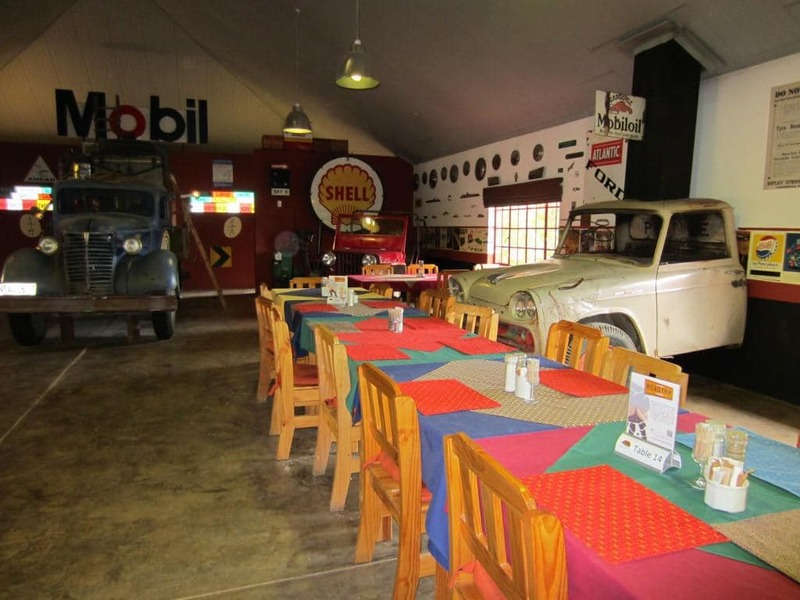 When the farm was bought and incorporated into the Gondwana Nature Park, it was decided to build a theme with old vehicles. Golden oldies are scattered all over the garden. 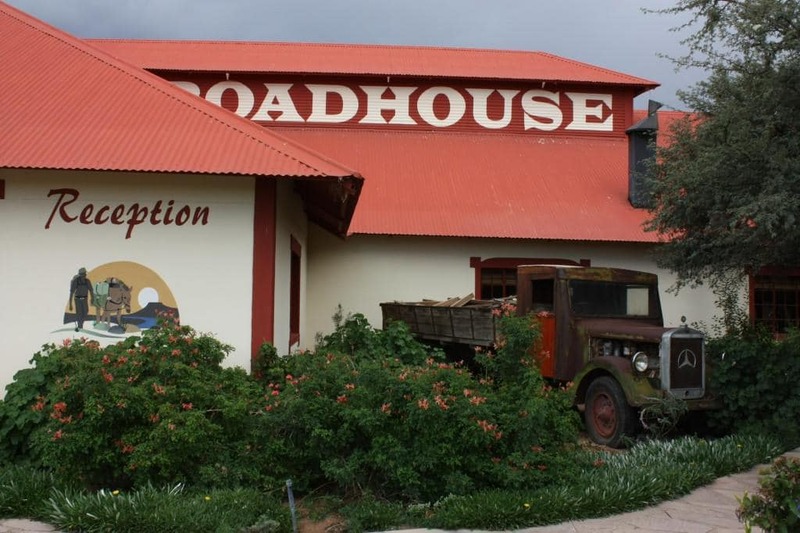 If you take the shortest route from the Fish River Canyon to Keetmanshoop, the C37, you will pass Canyon Roadhouse on your left shortly before the road links up with the C12 between Grünau and Seeheim. As one leaves the Ai-Ais National Park, you travel through the Gondwana Nature Park which consists of a few farms combined into one park. 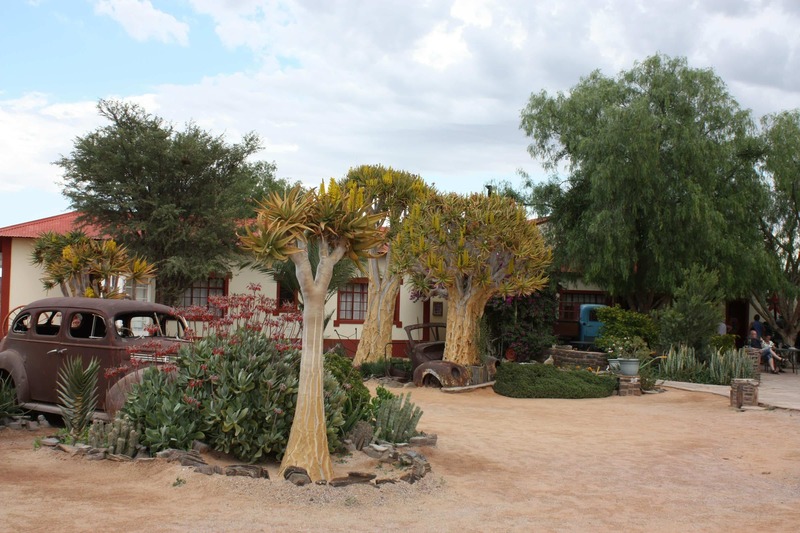 Canyon Roadhouse is one of the accommodation listings in the Gondwana Collection. the Canon Roadhouse page comes up every time I click on the camping pack list on the website of Tracks4Arfica blog page. it has been like that for WEEKS. 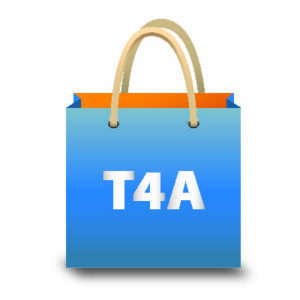 PLEASE PUT YOUR PACKING FOR CAMPING LIST ON where it should be, under Preparing for a trip and camping checklist. at the moment its nowhere. Thanks for informing us – I will get someone on this end to fix it – will let you know. It is fixed now! thanks! I agree, Neels! If you plan to stop at the Canyon Roadhouse, plan to stay over an extra day. Not a good idea to stop hear!! You might want to stay here for an extra day. ROFL.